Credit: W. Holland (JAC) et al. 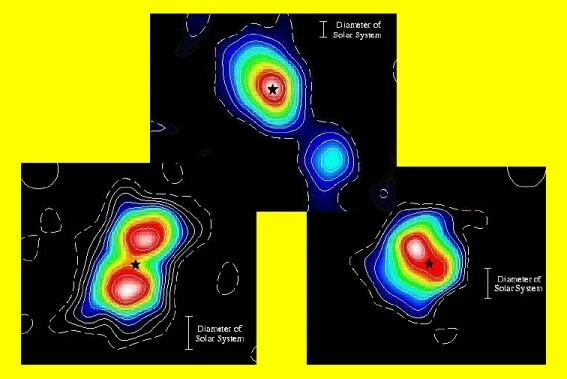 Explanation: These separate radio images reveal three dusty debris disks surrounding three bright, young, nearby stars - evidence for solar systems in formation. From left to right are the stars Fomalhaut, Beta Pictoris, and Vega, their positions indicated by star symbols. The false color maps show the intensity of submillimeter radio emission from the surrounding dust. Next to each dust "disk", a vertical bar illustrates the present size of our own solar system. These observations are likely examples of what our solar system would have looked like to distant radio astronomers when it was only a few hundred million years old! Astronomers speculate that bright blobs of emission near Vega and Beta Pictoris may represent dust clouds around developing giant planets. The radio images were made using detectors cooled to near absolute zero and the James Clerk Maxwell Telescope at Mauna Kea Observatory in Hawaii.